In the 1990s, influenced by the deconstructionist movement in literary theory and trends toward revisionist history, a cadre of academics and historians led by William Cronon began raising provocative questions about ideas of wilderness and the commitments and strategies of the contemporary environmental movement. While these critiques challenged some cherished and widely held beliefs -- and raised the hackles of many in the environmental community -- they also stimulated an important and potentially transformative debate about the conceptual foundations of environmentalism. 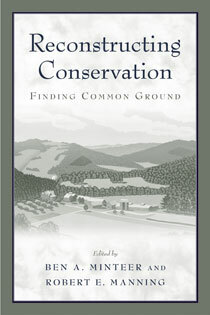 Reconstructing Conservation makes a vital contribution to that debate, bringing together 23 leading scholars and practitioners -- including J. Baird Callicott, Susan Flader, Richard Judd, Curt Meine, Bryan Norton, and Paul B. Thompson -- to examine the classical conservation tradition and its value to contemporary environmentalism. Focusing not just on the tensions that have marked the deconstructivist debate over wilderness and environmentalism, the book represents a larger and ultimately more constructive and hopeful discussion over the proper course of future conservation scholarship and action. Essays provide a fresh look at conservation icons such as George Perkins Marsh and Aldo Leopold, as well as the contributions of lesser-known figures including Lewis Mumford, Benton MacKaye, and Scott Nearing. Represented are a wealth of diverse perspectives, addressing such topics as wilderness and protected areas, cultural landscapes, rural/agrarian landscapes, urban/built environments, and multiple points on the geographic map. Contributors offer enthusiastic endorsements of pluralism in conservation values and goals along with cautionary tales about the dangers of fragmentation and atomism. The final chapter brings together the major insights, arguments, and proposals contained in the individual contributions, synthesizing them into a dozen broad-ranging principles designed to guide the study and practice of conservation. Reconstructing Conservation assesses the meaning and relevance of our conservation inheritance in the 21st century, and represents a conceptually integrated vision for reconsidering conservation thought and practice to meet the needs and circumstances of a new, post-deconstructivist era.